The comfortable three-star Hotel Arlecchino is popular with cruisers (the Marittima piers aren't far), and we've found it convenient for getting to the Piazzale Roma's airport buses in time to catch early-morning flights from Marco Polo Airport. 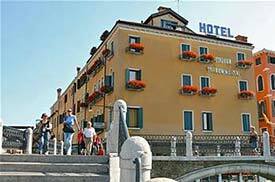 The hotel is just a minute or two from the Piazzale Roma, with one small bridge to cross. A few meters ahead, you'll see a food kiosk immediately before the Tre Ponti (three bridges). Bearing left to stay by the main canal, walk past the food kiosk to the bridge. Cross the Calatrava Bridge--officially named the "Ponte della Costituzione"--to the Piazzale Roma, then follow the directions above.